Wait times for patients to see a neurosurgeon at Westmead Hospital were previously as long as 12 months. By using existing clinical resources and identifying waste within the current system, patient wait times for appropriate treatment of back pain have been significantly reduced. The project also identified an opportunity to increase revenue by up to $450,000 per annum. 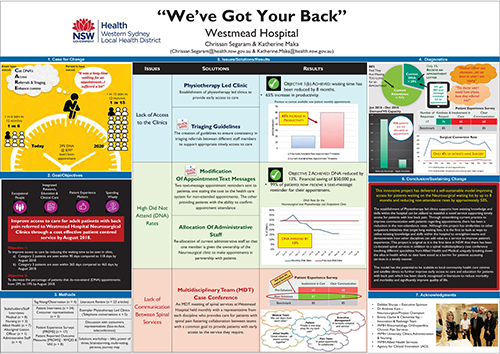 View a poster from the Centre for Healthcare Redesign graduation, August 2018. Within 12 months, improve access for adult patients who have been referred to the Westmead Hospital Neurosurgical clinic through a cost-effective patient-centered service. Results will be measured by the following targets: Category 2 patients are seen within 90 days compared to 118 days by August 2018; Category 3 patients are seen within 365 days compared to 463 days by August 2018; decrease did not attend (DNA) rates from 29% to 19% by August 2018. Standardisation of the management of referrals supports the correct allocation of patients for timely and appropriate care. A care management plan and early patient education reduces the potential for chronic symptoms to become worse. Early access to other spinal services through the co-location of clinics and a monthly case conference between spinal services. Use of existing knowledge and skills within the hospital to establish a physiotherapy led clinic, increasing the capacity for patients to be seen within the hospital’s set timeframes. Immediate communication between all services at Westmead who provide care for patients with spinal pain through the co-location of clinics. An appreciation and understanding of each specialty who provide care for patients with spinal pain at Westmead. A reduction in DNA rates improving both flow through the clinic and access to care. A self-sustainable model due to the cost effective strategies of reallocation and deployment of existing staff. One in four Australians will suffer from low back pain during their lifetime and Western Sydney’s population is not exempt. The neurosurgical clinics receive over 1,000 referrals each year with only 191 new patient timeslots to see these patients. Currently, one in six patients referred will see a neurosurgeon within 12 months. 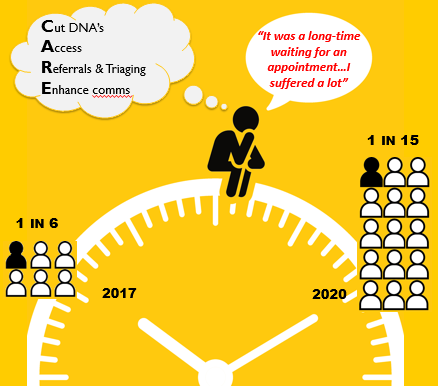 If there are no changes to the current service, in three years’ time only one in 15 patients will have access to a neurosurgeon within a 12 month timeframe (figure 1). 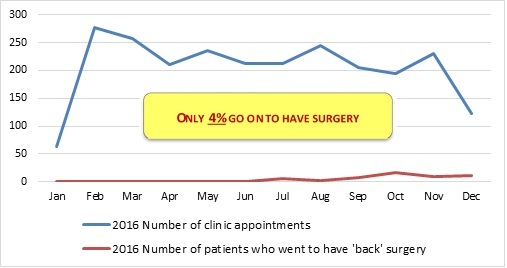 While waiting lists are increasing, recent data shows that only 4% of patients who attend the clinic over a 12 month time period will need to have surgery (figure 2). Therefore, the current waiting list has a large percentage of patients who may not need the skills of a neurosurgeon and would instead benefit from early appropriate conservative management and education. Patients who are referred to the neurosurgical clinics and need assessment and treatment by another spinal service may wait up to an additional 12 months for care as there is a lack of coordination and communication between spinal services. 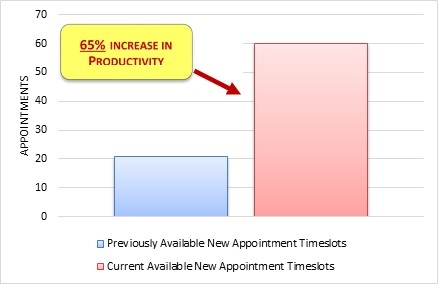 On top of the long wait time to see a neurosurgeon, this can have a direct impact on a patient’s ability to access timely, coordinated care; potentially increasing the chronicity of their condition. Three key issues were identified as a result of stakeholder consultation and data analysis. To address these issues, five solutions have been implemented to improve accessibility and appropriateness of care for patients. Previously, there was no verbal consultation with patients regarding appointments and only one per cent of patients received an appointment notification letter. This contributed to a high DNA rate of 29%, which equates to an opportunity loss of approximately $400 per 15 minute appointment. Solution 1: The modification of appointment text messages. Two text message appointment reminders sent to patients, one of which includes the cost to the healthcare system for non-attended appointments. Solution 2: reallocation of administrative staff. One staff member is given ownership of each neurosurgical clinic to book appointments in direct consultation with patients. Previously, only one in six patients referred to the clinic will be seen in 12 months, with 4%t of these patients requiring surgery. On average, Category 2 patients wait 28 days above the clinically appropriate timeframe and Category 3 patients wait 98 days above the clinically appropriate timeframe. Furthermore, there are no clear guidelines for triaging patients. This leads to variation between clinicians for triaging referrals and impacts access to care for patients. Solution 3: standardisation of triaging guidelines. Development of guidelines to ensure consistency in triaging referrals between different staff members to improve appropriate, timely access to care. Solution 4: physiotherapy led clinics. Identification of existing clinical skills within the hospital to establish physiotherapy led clinics providing access to care. This new service was modelled on other outpatient hospital clinics. Services dealing with spinal pain at Westmead had no internal referral pathway due to a lack of integration between services disrupting the continuum of care. Solution 5: establish a multidisciplinary team case conference for spinal services. A monthly multidisciplinary team meeting of spinal services at Westmead Hospital provides staff with the opportunity to discuss and refer patients who may benefit from early intervention from another service. Implementation – The project is currently being implemented, piloted and tested. The success of this solution was measured by tracking the percentage of patients receiving the text message. This has improved from 24% when the project started in 2017 to 99% in July 2018. The effectiveness of the text message was indirectly measured by the percentage of patients who DNA their appointment. In September 2017 the DNA rate was 29%. Post implementation this number has dropped to 16%. 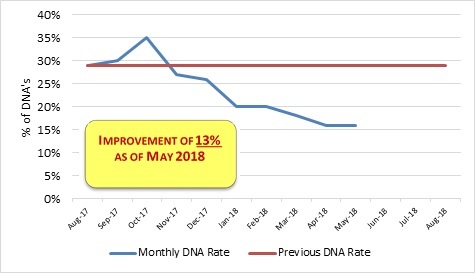 Enabling administrative staff to book appointments in direct consultation with the patient, together with the implementation of text messaging for appointments (solution 1) decreased the DNA rate by 13% (figure 3). This efficiency improvement has generated additional revenue estimated at over $50,000 per annum. To determine whether the triage guidelines developed provided consistency in triaging outcomes, the guidelines were tested by providing five different clinicians with the same referral. The action taken showed that clinicians are following the guidelines for consistency in triaging outcomes. Adherence to the triaging guidelines was measured through the percentage of patients referred to the physiotherapy led clinic who required surgery. This measure was in place to ensure that the triaging guidelines were successful in allocating patients requiring surgery to a neurosurgeon. Current measures indicate that only 0.01% of patients were referred inappropriately to the physiotherapy led clinics. These patients require surgical intervention rather than conservative management. The outcome supports the effectiveness of the triaging guidelines in allocating patients to the appropriate clinician. The establishment of the physiotherapy led clinics has increased the number of patient appointments per month and generates the hospital approximately $225,000 per annum. This has increased the productivity of access by 65% (figure 4). Plans are in place to increase this number by an additional 120 clinic per month, with a projected increase in revenue of $450,000 by August 2019. This solution was measured using the 'My Experience Matters' survey which gave an improved score above the local health district benchmark of 98 for patients feeling they were 'treated with kindness and respect' (table 1). Further check measures for this solution include the number of re-presentations to the emergency department for patients seen by the physiotherapist. This will be evaluated at 6 and 12 months post implementation. To date, there has been 100% attendance at the spinal multidisciplinary case conference. Positive feedback from stakeholders supports this multidisciplinary team forum and the value of investing in collaboration between staff and spinal services (figure 5). The importance of time management and early planning. Strong sponsorship is critical to the success of a project. Stakeholder engagement is fundamental to sustaining the change. Clear communication and ongoing engagement with all key stakeholders is important throughout the project. There are strong benefits to partnering with consumers and patients to identify and understand issues and develop solutions. Trust the methodology taught by the Agency for Clinical Innovation and focus on each phase of the project rather than the overall project goal and aim. Braybrooke J, Ahn H, Gallant A, et al. The impact of surgical wait time on patient-based outcomes in posterior lumbar spinal surgery. European Spine Journal 2007; 16(11):1832-1839. Chang A T, Gavaghan B, O’Leary S, McBride L F, Raymer M. Do patients discharged from the advanced practice physiotherapy-led clinics re-present to specialist medical services? Australian Health Review 2016; 42: 334-339. Simon D, Coyle M, Dagenais S, O'Neil J, Wai E K. Potential triaging of referrals for lumbar spinal surgery consultation: a comparison of referral accuracy from pain specialists, findings from advanced imaging and a 3-item questionnaire. Canadian Journal of Surgery 2009; 52(6):473-480.